Find out what issues may be present in your home's water supply with a test kit. Just fill out the form to the left and check the box next to "Diamond Crystal Salt Water Test Kit Request." Diamond Crystal® has been in business since 1886. Diamond Crystal® Salts provides salt for many different uses in and around your home. Diamond Crystal® provides your family with salt for better tasting food, soft water for your skin, dishes and plumbing; with ice melting for your families safety when you walk in the winter time, and clean water when you swim in summer. 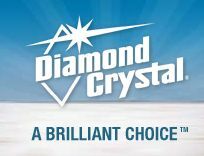 Diamond Crystal®: Providing Brilliant Salt Solutions™ Since 1886.